One thing’s for certain. 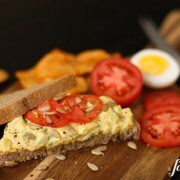 In the weeks surrounding Easter, you’ll find egg salad in our fridge, ready to be spread for a sandwich. Or scooped up by crispy salty barbecue flavored potato chips, a chips and dip appetizer disguised as my main course. It’s true. 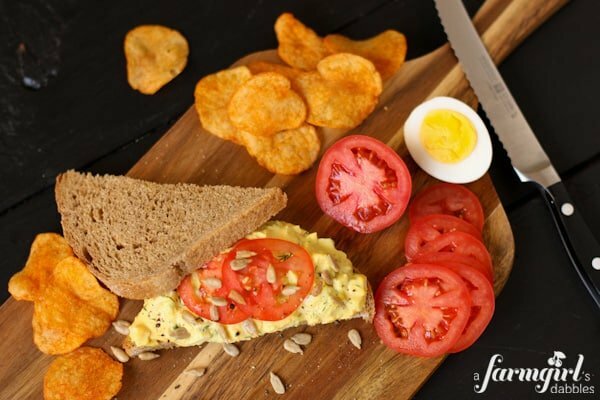 Egg salad on chips makes the perfect lunch! I don’t ever remember not liking egg salad sandwiches. Or the somewhat similar deviled eggs. There’s just something about that bright yellow egg yolk mixed with the creamy tang of mayo and mustard that has always pulled me in. I find it so disappointing to bite into an egg salad sandwich, only to taste the egg white drowning in a whole lot of mayo. When you’re not in the comfort of your own kitchen, about all you can do is sprinkle it to death with salt and pepper. And that still makes for a sorry lunch intake. 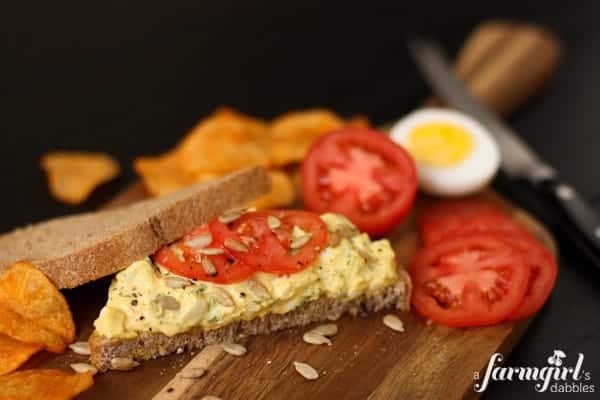 So I promise you that these Herby Egg Salad Sandwiches are anything but boring. They’re filled with yolky tastiness, and are not overbearingly gloppy in the mayo category. With a bit of celery, just like Mom does it. And plenty of fresh herbs, as they go so beautifully with eggs. A touch of smoked paprika and cumin add depth and warmth, to round it all out. This salad (or dip!) has alot going for it, that’s for certain. To hard boil the eggs, place them in a pot and cover with cold water by 1”. Bring to a gentle boil. Then turn off heat, cover, and let sit for 13 minutes. This will give you a nicely set yolk, perfectly yellow. Prepare an ice bath in a large bowl and then add the cooked eggs to stop them from cooking any further. Let them sit in the ice bath for 3 minutes, and then remove to a towel to dry. Crack and peel each egg and then slice them in half. Place the yolks in a medium mixing bowl along with the vinegar, mayo, and mustard. Blend well. Chop the egg whites to desired size and add to the yolk mixture, along with all the remaining ingredients. Fold until fully combined. Test for flavor and adjust if needed. 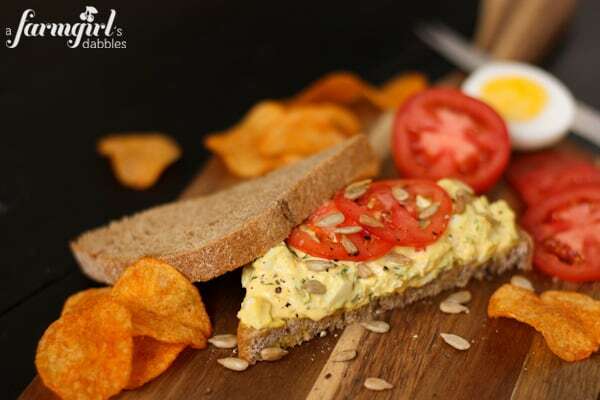 Serve on sliced bread, with thin slices of fresh tomato and a sprinkling of sunflower seeds. I also highly recommend a handful of crispy salty barbecue flavored potato chips alongside!